Imprisoned since the dawn of time, Rovagug (pronounced ROH-vah-gug) seeks only to destroy creation and the gods. His increasingly restless stirrings are taken by many to be the cause of volcanic activity and earthquakes. In a time so long ago that perhaps even the aboleth do not remember it, and before the entity known as Zon-Kuthon emerged from the Outer Darkness, Rovagug sought to destroy the world. In a rare showing of solidarity, all the gods stood together to defeat him. Unable, or perhaps unwilling, to destroy him, the goddess Sarenrae sliced open a hole in the world, and the archdevil Asmodeus bound him with a key only the Prince of Darkness held. This prison is believed to be the Pit of Gormuz on the continent of Casmaron, in a region known as the Windswept Wastes. It was an imperfect captivity, and 3923 years before Aroden raised the Starstone, his prison split open, and one of the terrible Spawn of Rovagug was discharged into an unsuspecting and already miserable world. It would be the first of a dozen unleashed over the next 5,000 years. While Rovagug hates most deities equally, he reserves especial hatred for Sarenrae, who was instrumental in combating the Rough Beast long enough that the archdevil Asmodeus could imprison him. This hatred is returned by all other deities as well, and even feuding gods joined together to seal Rovagug away from the world. Rovagug's relationship with the mysterious Groetus is unknown at this time. 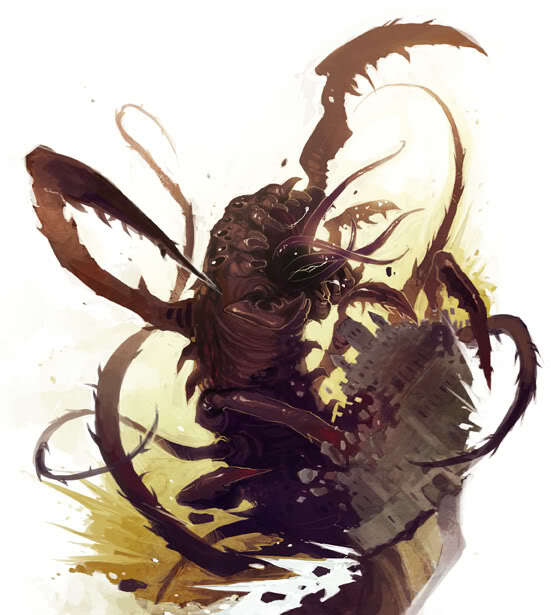 The Rough Beast's avatar appears as a monstrous, worm-like being, with innumerable limbs, eyes, claws, teeth, and other, more unmentionable parts. The horrific Tarrasque is Rovagug's current Herald, although prior to its birth, other Spawn have served in this capacity. Rovagug's most famous emissaries are the great beasts known as his Spawn. The Tarrasque is widely considered to be the greatest of these Spawn. Unnamed Spawn (-3923 AR) - The first of these terrible monsters. Its status and whereabouts are unknown. The orc oracles of the Brimstone Haruspex claim that its name is Gormuz (as in Pit of Gormuz) and that it will return again when a dark comet appears in the sky. The few remaining records of the time state that it was impervious to weapons and spells, but headed west across the sea and was never seen again. Many consider it was in fact Ulunat. Ulunat (ca. -3470 AR) - A colossal beetle, around whose shed carapace the Sarathi capital has grown up. The Tarrasque (-632 AR) - Also known as The Armageddon Engine. The most terrible of the Spawn of Rovagug. Currently sealed away in a hidden cavern beneath Guldar. Volnagur (??? AR) - A winged beast. Xotani - Also referred to as The Firebleeder. Its grave lies in Laminia. Chemnosit (??? AR) - Also known as The Monarch Worm. Feared throughout the Darklands; possibly still active. The Slohr (3537 AR) - It is unknown if this terrible beast, known primarily for trampling the Arthfell Forest, is truly a Spawn of Rovagug. Crawling Hunger, an intelligent, beclawed purple worm. Galulab'daa, a gibbering mouther considered to be more violent and insane than most of its kind. Yigachek, a bebilith with an unusual corpse-like coloring. Rovagug has no large-scale, organized church. His worship is most concentrated in the savage lands of the Goblinoids, the frozen Realm of the Wintertop Mountains, and the harsh deserts of Sarath. Rovagug is certainly respected for his destructive power in all nations; the bombard known as the Great Maw of Rovagug in Selrune is evidence of this. His worshipers are savage monsters and human nihilists. He is the primary deity of the orcs, and ropers consider him to be their creator-deity. The Carrion Tribe gnolls in Guldar have abandoned the worship of Lamashtu for the favor of Rovagug — how the Mother of Monsters feels about this is unknown. Priests wear shaggy coats dyed in strange colors and hideous masks representing monstrosity and dissolution. A priest of Rovagug makes no contribution to normal society; at best, they may be (unreliable) mercenaries. They typically spend their day hunting beings and things to kill and destroy, saving only that which can be utilized in creating greater destruction. The hierarchy is based solely on raw destructive might, and to rise in the hierarchy, another must be thrown down. His worshipers are only slightly less dedicated, glorying in destruction for its own sake and dismissing building and creating as a pastime for those too weak to destroy. Some worshipers do so out of nihilistic misery, others out of self-loathing, and yet others through a simple, burning rage towards the universe. All are dedicated to Rovagug's destructive mission. In Prav the worshipers of The Great Beast have completed a mad quest to blot out the very sun itself - an act of revenge against the hated Sarenrae. Churches to The Beast are banned in nearly every civilized city, and his worship is suppressed in most nations. 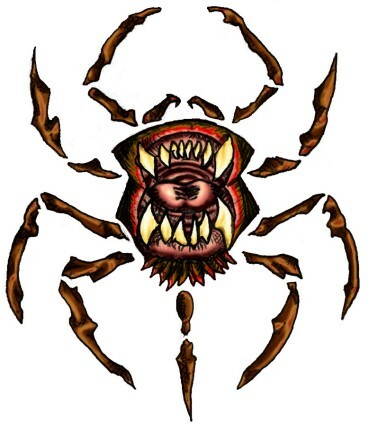 Secret shrines and sacrificial sites may be recognized by the presence of the famous Fanged Maw, or the less common symbol, a claw surrounded by a spiral. The rare, true temples of Rovagug are built in caves and other underground locations, with a deep pit in the center (representing Rovagug's prison) that doubles as a midden. These temples also feature a "tame" monster, barely controlled by the priests, which serves as a guardian. The House of the Beast is a nigh legendary temple of Rovagug, said to have been built by a spirit birthed from the very heart of a volcano, and was the center of a multi-race cult that gained strange and terrible powers in return for sacrifice to The Great Beast. Located in the Pale Mountains, this currently ruined temple is widely avoided because of its dark reputation.